The Costa coffee shop near London Bridge is rammed with families, couples and police officers. It offers some relief after a long night. Horrific scenes unfolded in the surrounding streets on Saturday. Seven people were killed and 48 injured before the attackers were shot dead by police. Paula Worrall, 38 from Liverpool, is still in her party dress. She was unable to return to the nearby Premier Inn hotel after her night out ended so suddenly. "You have to carry on regardless but it definitely puts you on edge," she says. "It's a bit eerie here. But the police have been fabulous. We just want a shower, a pair of jeans and some flat shoes." Dario Barbagallo, 33, stands by the police cordon after returning to the scene - less than 24 hours after being caught up in the attack. He was walking through London Bridge when he saw what he described as a "huge fight". "I thought it was drunk people but then I saw the police coming out. "I saw a terrorist stab an officer and a citizen. I was frozen. I saw three bodies on the pavement. The paramedics were doing CPR and a few of their friends were trying to help them." Dario, who is originally from Italy, credits the police for doing an "amazing job" and says he wants to come back to the scene because he "feels part of the city". He adds: "Even though I'm not British I feel this place is my home. If something happens I'm part of that as well." Flowers are laid at the scene, as people come to pay their respects to the victims. Imam Abdul Arif, 27, from the Ahmadiyya Muslim Community, says he wants to "show solidarity". "I'm a Londoner," he says. "I came here because it happened to my home city and it happened in the name of my religion. "I came to show solidarity and to show it's not in my name." Imam Arif was breaking fast and finishing his evening prayer as part of Ramadan when he heard the news of the attack. "Ramadan is a time when you should be worshiping and serving humanity more than ever and these people perpetrated such a crime. "My hope is that everybody is united and show the individuals who want to divide us they won't be successful." Several tourists walk past wheeling their suitcases as they attempt to make their way out of the capital. Many are glued to their phones as they try to navigate the police cordons which remain in the area. They look tired but upbeat as they wait patiently to be allowed back into their hotels. Susan Dixon, 39, was visiting London from Newcastle with her husband Martin, 37, and their children Alex, five and Niamh, seven. Susan says: "Our children have asked about it as they overheard a lot in the pub. We just told them there are some nasty people out there but lots of good people." 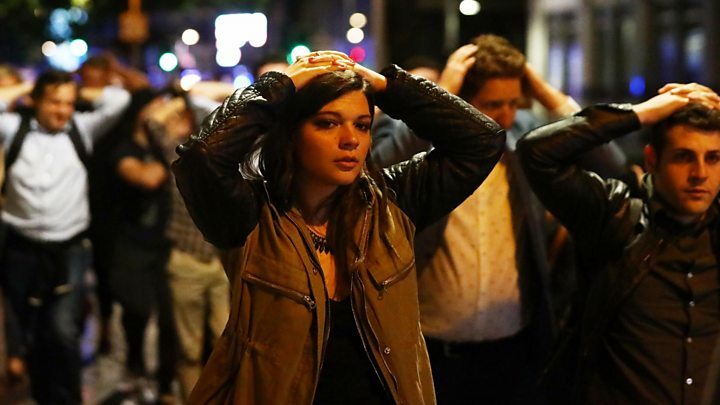 Ian Stewart, 48, from Glasgow, was stuck outside his hotel after the attack. "We were waiting outside the Shangri-La hotel when about 50 people came rushing up the road with their hands on their heads," he says. "The police had guns on them and were videoing them. At that point we decided to leave the area." Ian said hotel staff had refused to let stranded people into their hotel. "They were terrible. They wouldn't let us charge our phones. There were four bouncers on the door. "It wasn't like Manchester where everyone stuck together." Paul Brackley, general manager of Shangri-La Hotel, said: "We deeply regret not being able to allow Mr Stewart into the hotel when he was in the area. "We were able to shelter 40 people who came into the hotel to seek assistance immediately following the incident. "At one point, we were instructed by the police not to allow anyone to enter or exit the hotel as part of the emergency response. "We apologise for any misunderstanding, and our thoughts are with the victims and their friends and family." Many of the bars and restaurants that would normally be ready to welcome families for Sunday lunch have their shutters down on Sunday. But the Borough off-licence is open. Shop worker Arife Buz, 34, says: "It's business as usual for us. "We checked with the police whether we could open and they said it was okay. "It looks so busy here. It's not usually like this at the weekend as all the offices around here are closed. "I freaked out when I heard about the attack. It's very scary." Earlier, hospital staff and railway workers struggled to get through the extensive police cordon. William Gendo, a chef at Guy's Hospital, was unable to get to work for his morning shift. "Its completely closed. There's no way to get through. We've been trying for a few hours," he says. William woke to the news of the attack, with friends and family contacting him to see if he was okay. "I was a little bit worried travelling in but I set off anyway. You have to try. What else can we do?" Estefany Alcivar, who is a kitchen assistant, says she spoke to a nurse last night who told her staff were staying on to do extra hours and help patients with their food. "We don't know what to do," she says. "There will be no hot food but they will have sandwiches and tea and coffee." She says she felt "worried" hearing about the attack. "It's very near my work and I'm in London Bridge all of the time. It feels weird." He says: "I'm not feeling worried. I'm strong enough. "These enemies are trying to divide us but we have to be together."